화면 가득 노사나불을 그린 독존형식의 괘불인데, 괘불이란 절에 큰 법회나 의식을 진행할 때 법당 앞 뜰에 걸어놓고 예배를 드리기 위해 만든 대형 불교그림을 말한다. 이 괘불의 노사나불은 둥근 얼굴에 화려한 보관을 쓰고 있으며, 연꽃가지를 오른손으로 들고 왼손으로 받치고 있는 모습이다. 보관 주위에는 비로자나불 형태의 조그만 불상이 7개 있으며, 뒤로 머리광배가 둥글게 둘러져 있다. 둥글고 풍만한 어깨 양쪽으로 붉은 옷이 걸쳐져 있으며 팔꿈치 부분까지 머리가 흘러내려와 있다. 옷의 아래 부분과 등뒤의 광배는 하늘색으로 나타내었고, 등에서 머리 위쪽까지는 오색광선을 그려 넣어 화려함을 더하고 있다. 숙종 30년(1704)에 그려진 이 그림은 붉은색과 녹색을 주로 사용하여 조선 후기 불화의 특징을 잘 나타내고 있다. 거친 삼베바탕에 그려 다소 굵게 표현되고 있지만 정밀한 묘사와 치밀한 구성으로 세련미를 보여주고 있다. 순조 22년(1822)에 수정한 적이 있으나 둥그스름한 얼굴과 어깨, 약간 처진 눈썹, 색상 등 조선시대 효종·숙종대의 전형적인 양식을 나타내고 있어 중요한 작품으로 평가되고 있다. This type of large-sized painting used to be hung in the front courtyard of a temple hall at an open-air sermon session or ritual. Rocana Buddha with a round face wears a crown. He holds a lotus twig with the right hand and raises it with the left hand. 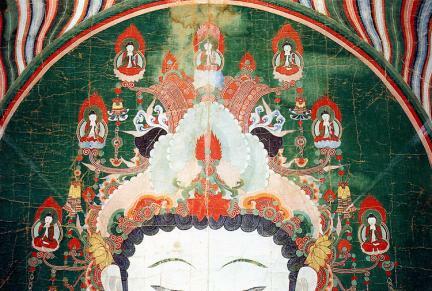 Seven miniature Vairocana Buddha-shaped images surround the crown, with a round mandorla portrayed behind the head. The Buddha has round, plump shoulders and hair reaching down to the elbows and wears a red robe. The lower part of the robe and the body mandorla are portrayed in blue. The five colored strands of ray from the back up to above the head add to the beauty of the painting. 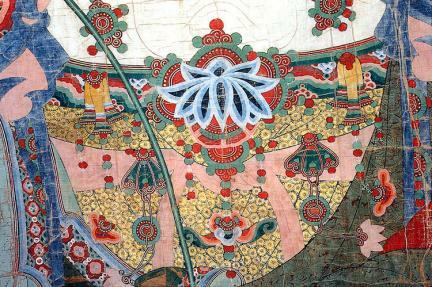 Using mostly red and green colors, the piece was made in 1704 (the 30th year of King Sukjong’s reign). 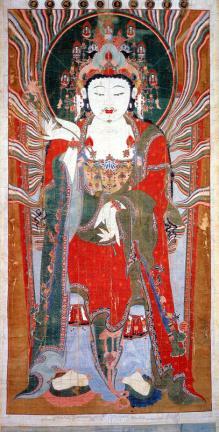 It shows the features of Buddhist paintings of the late Joseon Period well. Looking rather rough as one made on coarse hemp cloth, the piece displays exquisiteness in portrayal, compact composition, and refined esthetic taste. It was repainted once in 1822 (the 22nd year of King Sunjo’s reign). 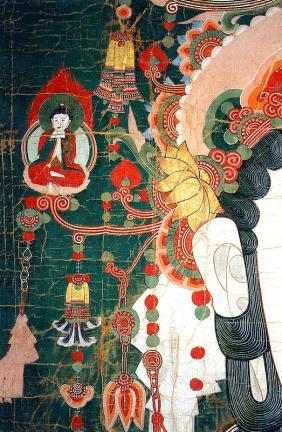 The round face and shoulders, eyelashes, and colors show that the piece is typical of works made during the reign of Kings Hyojong and Sukjong. Thus, it is regarded as a valuable one by experts.